To my surprise, a video I shot in my backyard and uploaded to YouTube showing how to move a storage shed has produced the highest number of views of any video I have uploaded to my YouTube account. 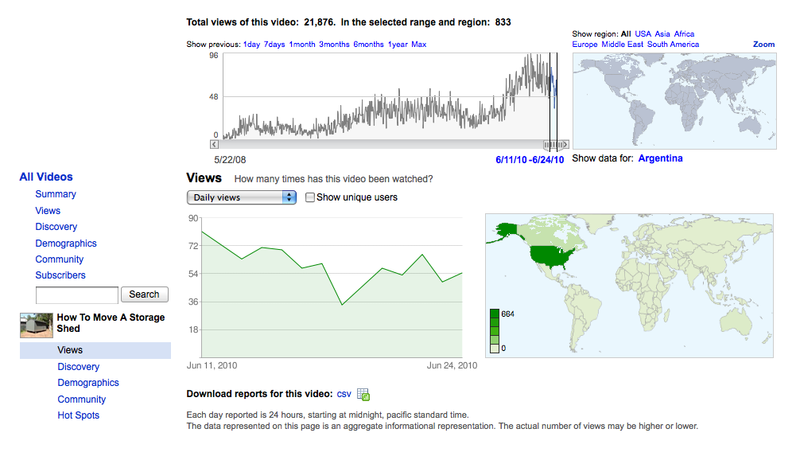 The video has received 21,876 views since May 2008. During the last two week period, 31.5% of the video’s views were originated by a Google search for “how to move a storage shed’. 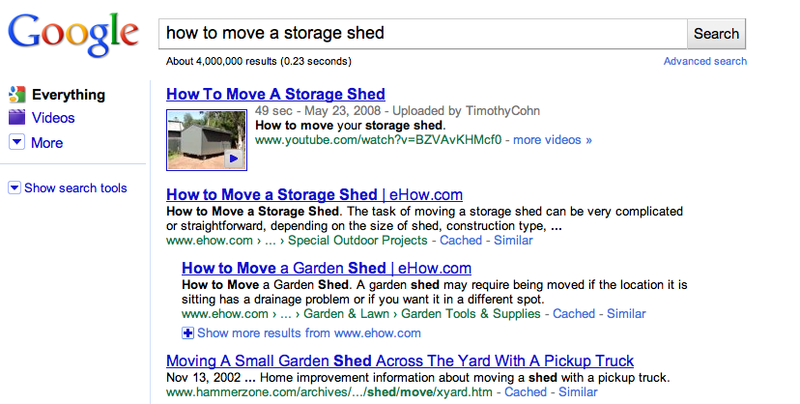 No surprise there – my video is the first link found under the search for “how to move a storage shed” in Google. 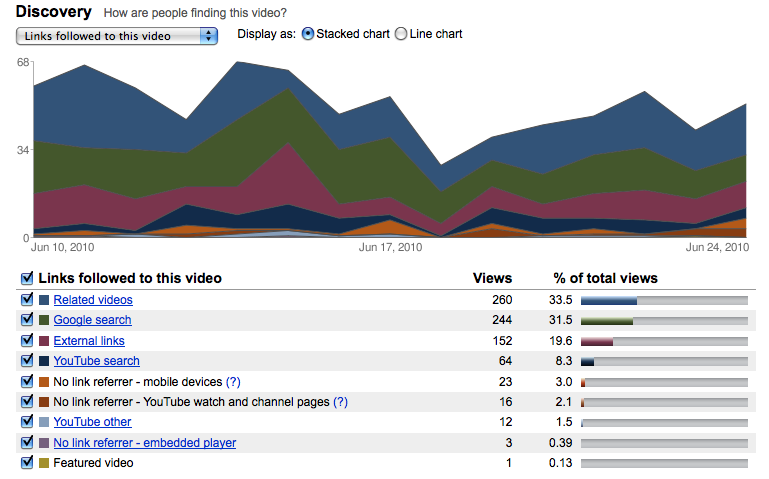 Related videos however provided 33.5% of the video’s views. A look at the key phrases used upstream before referral to my video reveal that not every video and its content’s description were either what the audience had described or had expected to find. My selection of the video’s title and description was the result of having spent years studying searcher behavior. 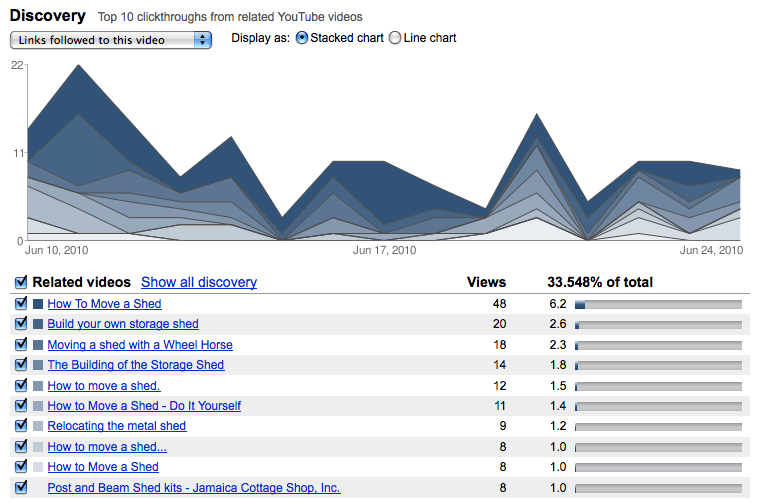 Google’s locating my video atop their search results for “how to move a storage shed” illustrates the importance of knowing how to reach the Google audience with terms both Google and their audience prefer. You’ll find the option to set up Ad Sitelinks in your Campaign Settings tab. It will appear as “Show additional links to my site” under the “Ad extensions” section. I haven’t yet tested Ad Sitelinks in any of my Google Adwords campaigns – have you? Lately, Twitter the “service” has been having some reliability issues with its website loading consistently along with overall up-time availability whether through the web or phone. Today when I opened my Google Chrome browser I noticed the following Twitter link association no brand by definition would ever want to be associated with. If you will notice, the three other web brands above Twitter don’t have derogatory terms attached to their brands. Imagine how long Google, Yahoo or Bing would remain in business if their site’s were “Over Capacity” every time a visitor tried to access their pages. Not for long. They would be ran out of business by those businesses that could deliver their service consistently! Yet Twitter users continue to endure the outages. What business can consistently not deliver its primary product and still stay in business? How many times have you logged into Twitter or attempted to Tweet from your phone only to be greeted by the infamous fail whale? Its been said word of mouth is caused by either above or sub-par experiences with a company or its brand. Well I am so sick and tired of logging into Twitter not knowing whether I can actually use it that I am writing this post about my increasingly negative experience with the Twitter brand. My sub-par experience compelled me to write this. I couldn’t stop it once it started either! Brand management is predicated first on delivering the brand’s promise to its customers. Twitter is failing to do the only thing they have promised to do – deliver Tweets! Thus, I am bailing on the Fail Whale. The fact that sub par experiences with Twitter have its own nomenclature doesn’t bode well for the brand long term either does it? 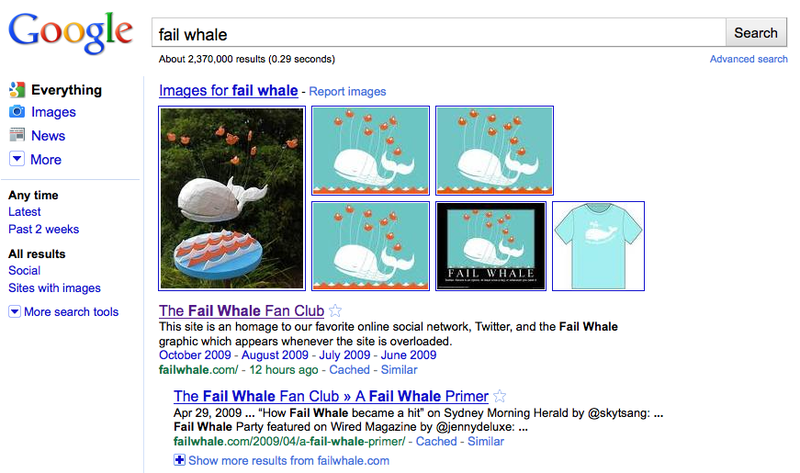 A Google search for Fail Whale produces a slew of continuous new results around the clock, 24 hours a day, 7 days a week, 365 days a year. The fact that each and every one of Twitter’s users elect to pay their attention to and invest their precious time in Twitter’s service only to be shortchanged by its reliability apparently hasn’t yet caught the full attention of Twitter’s management team or its investors. It it had, myself and the countless others complaining about the fail whale wouldn’t be Tweeting or blogging about how they are fed up with Twitter. Will Twitter one day find itself subjected to a “Stop Wasting My Time and Energy Twitter” crowd campaign like the recent Facebook privacy fiasco? Whether that day and the “Stop Wasting My Time and Energy Twitter” crowd movement begins or not, I am beginning my own personal Twending campaign now. Friends of Friends: What Are They Worth On Social Networks? A client is considering a social marketing campaign to increase their friend count on Facebook by offering existing “friends” and “fans” a prize to the person who refers the most new friends. 1. What are friends of friends worth on social networks – now or later – something or nothing? 2. Do friends of friends have potential value to the business vis-a-vis direct future sales or not? 3. If so, how do you know? 4. Or does the addition of friends of friends in the friend or fan network in and of itself – whether now or later – produce value to the business and its brand? 5. If so, how is the “value” to the business calculated? While there are obvious reasons for being widely known, at some point adding friends of friends via social networks must surely yield produce diminished returns. 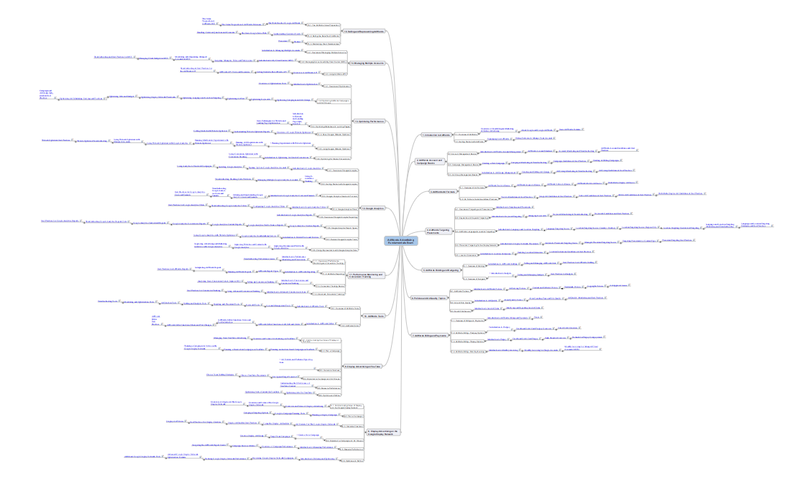 I have been working on getting my arms around all of Google Adwords key attributes and so far all I’ve got to show for it is this mind map. 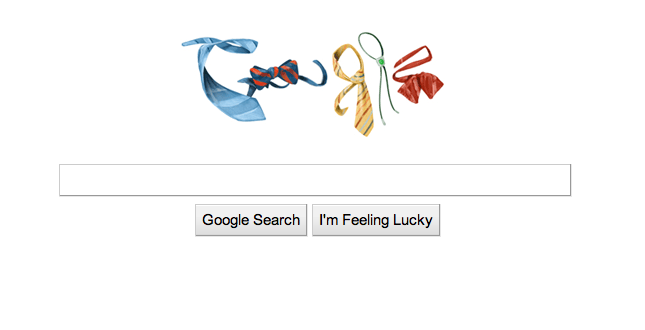 Google has replaced its traditional logo with Neckties and Bow Ties to honor Father’s Day 2010. Since it was almost 100 degrees here today and I spent the better part of the day in the lake, my visit to the Google home page was a close as I came to seeing either type of tie. 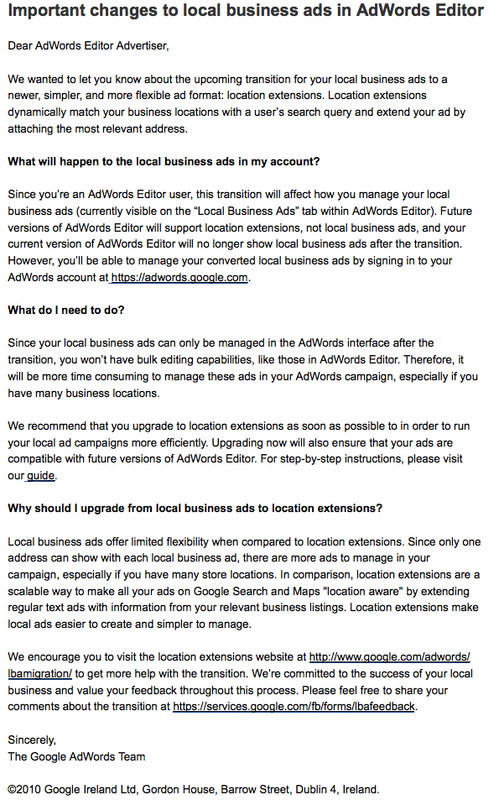 Google Adwords Editor will no longer support Local Business Ads in future releases. Instead, Adwords Editor will support Location Extensions. 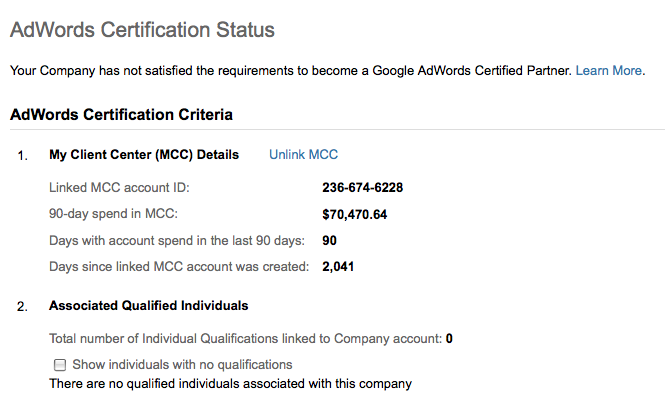 Why doesn’t online advertising spend alone qualify an individual or company for Adwords certification? Businesses as a rule won’t spend money on search advertising that doesn’t produce results. Individuals and the companies they work for who produce results online through Google’s search advertising products are by definition qualified. In this video learn about the new features in Google Commerce Search 2.0, including additional merchandising controls for retailers and an improved online search experience for shoppers. Google Commerce Search, initially launched just seven months ago, is an enterprise-grade website search solution hosted in Google’s cloud and designed for specific retail needs like parametric sorting and fast search result loading. More merchant customization: Today we’re launching a full merchandising dashboard, giving merchants more control over promotions, ranking rules and filtering – with no custom code so marketers and product merchandisers can do all of this themselves. New intuitive retailer controls like time-based promotions, full left-hand panel facet control and simple product ranking rules mean seasonal optimization on the fly. Unparalleled shopper experience: With query autocompletion, retailers can offer common queries to shoppers in real time, as they type, without any custom coding. Search quality improvements make GCS faster and more relevant than before. Because it’s hosted in the Google cloud, search results are returned to shoppers in less than a second. Spelling and stemming dictionaries and new custom synonyms mean that shopping on a retail site can be as easy and accurate as searching on Google.com. Better browsing and navigation: Though more and more shoppers are turning directly to the search bar on retail sites when they’re looking to make a purchase, some people will always prefer to navigate through different categories and discover new products. Now, Google Commerce Search allows visitors to shop by browsing around your site as well as searching directly for products. 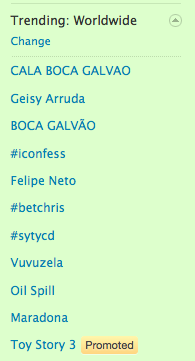 I saw my first Promoted Tweet tonight in Twitter’s Trending: Worldwide list. Toy Story 3 from DisneyPixar. 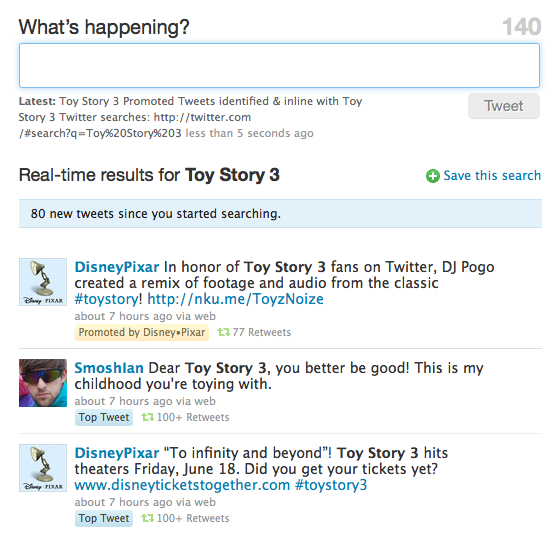 DisneyPixar’s Promoted Tweet also found its way into Twitter search results for Toy Story 3. Whether any of this attention on Twitter translates into measurable increased word of mouth for the film or better yet increased box office sales remains to be seen.